A very interesting aspect of our STS-spiral coils is the type with inverted fill material that is used, for instance, for polishing, descaling or removal of corrosion off rods or wires in a continuous operation. With an outside diameter of only 20 mm it is possible to reach an inner diameter of zero. Offering an enormous choice of dimensions and fill material qualities this brush has almost unlimited applications. The pioneering of this brush type has left its mark and shows in every detail of this brush. The diagram below shows how the STS coil is constructed: the fill material is fixed with a locking wire inside the backing tape. 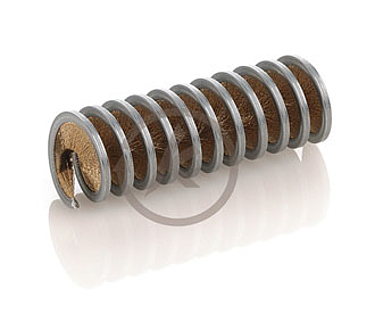 We manufacture our STS-spiral brushes in eight different coil widths (WB) from 2,5 - 13,5 mm. As material we use mild steel, stainless steel (1.4301 or 1.4571) or brass. The STS-spiral coil offers an enormous choice of dimensions in fill material, fill configuration, fill density.